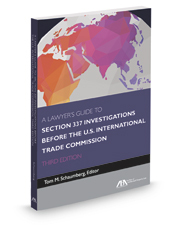 Published by the American Bar Association (ABA), A Lawyer's Guide to Section 337 Investigations before the U.S. International Trade Commission reflects insights from decades of cumulative experience before the U.S. International Trade Commission (ITC). As practice under Section 337 has grown, particularly in the last several years, so has interpretation of the law. Many precepts once taken for granted have been overruled and others have arisen that will survive until challenged in the future. This revised, essential guide provides an introduction to practice under Section 337 before the U.S. International Trade Commission for those who are not familiar with it, or for those who want a quick update about what to expect when filing a complaint or in being named as a respondent in a Section 337 investigation. A Lawyer's Guide to Section 337 Investigations Before the U.S. International Trade Commission includes informed analysis and explanation of the participants in these investigations and discusses the unique role played by the ITC. It also focuses on the procedural rules of a Section 337 investigation, including preparation of a complaint, the discovery process and other pre-hearing procedures, the hearing and post-hearing processes and the remedies available to a successful complainant. Other topics addressed include enforcement of a violation ruling, parallel litigation and appellate court review of Commission decisions.